HOW DOES RELIGION AFFECT MY LIFE? This is the first of a series that I will put together to show people how my catholic faith affects my life. Why does anybody do what they do? Because they are programmed for God, because without God we’ll forever have a restless heart. Our spirit guides us into doing what we do. I recently came into full understanding of what PURGATORY is all about. I knew about it from a child, but really never stopped to think or research more on this topic until I was given an auditory tape that explained it fully. Why should I believe in it at all one might ask? Well!!!! I don’t want to waste this life on a 50/50 % chance. I cannot come back and change my life but I can change my future. I can’t change my eternity. I believe that this life is so very short and when I think back I just realise how quickly this life is passing. So then, PURGATORY IS a place of cleansing or purifying. ” The Catechism of the Catholic Church teaches: verbatim All who die in God’s grace, but still imperfectly purified, are indeed assured of their eternal salvation; but after death they undergo purification, so as to achieve the holiness necessary to enter the joy of heaven (1030). Let me break that down a little. The word purgatory is the label given to us using hundreds of years of intelligence. The word bible does not appear in the bible either. However, the description of what is written down (see above) is just that-Purgatory. Not all christian bibles will have 2 Maccabees 12: 41-45 as it has been omitted. My protestant friends tell me that salvation is automatic if you choose God, but I don’t think it’s that simple. sin that may come to us or that we partake in? No, He doesn’t, God allows evil in the world. When Jesus died on the cross, He forgave the repentant thief because he repented out aloud to Jesus. He asked for forgiveness and Jesus told him that he would be with Him in paradise. He had already suffered a terrible death on the cross like Jesus and that would have counted towards his atonement, but do we know for sure that the other thief went to heaven too? Who knows?????? Anything imperfect cannot enter heaven. It’s pretty straight forward. GOD IS LOVE, JESUS IS THE SACRIFICIAL LAMB OF GOD WHO DIED, SO THAT WE CAN BE PURIFIED OF SIN IF WE REPENT AND FORGIVE. Jesus does not go to purgatory but Mary does. Mary the great intercessor of us all. 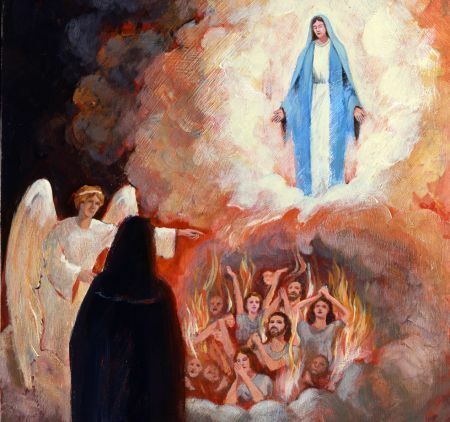 Mary who has been elevated to the Queen of Heaven, the mother of God’s Son and the Mother of us all, visits purgatory often as a reprieve to those waiting to enter heaven. We as humans are not expected to know everything about God or His plans. We grow into the truth and sometimes the people of His choosing get messages from God from Jesus or Mary. Isn’t that how the prophets knew about Jesus and who He was? Isn’t that how that oral tradition was passed on and eventually written down? Isn’t that how John wrote the book of Revelations? Well, in this case Jesus chose to reveal the afterlife- hell, purgatory and heaven to Sr. Faustina, why her you might ask??????? God chooses those who will honour Him and bring glory to His name and Sr. Faustina (now a Roman Catholic saint) was just that person. 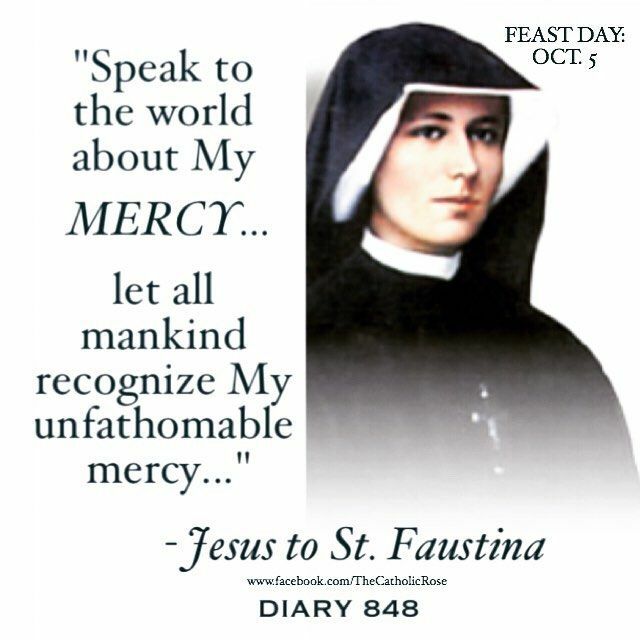 -Her Diary: Divine Mercy in My Soul, is a book she wrote based on the contents of her diary from 1934 until her death, in 1938 in which she describes vividly her visions( click below for more info). Why would Jesus reveal these to her? Because God wants us all with Him in heaven and He will stop at nothing to help us get there. So how has this changed my life??? Well, I go to confession to repent of my sins. I don’t hold grudges, I quickly ask for forgiveness from those I have wronged. I try to pass the message on to others. I have taught students at school about this and my own children at length, so there is no mistaking purgatory for what it is and that it is a real place. I ASK THE HOLY SPIRIT TO REGIFT ME, SO THAT I CAN BE BETTER AND BE THE BEST VERSION OF MYSELF. I ASK GOD TO ALIGN MY WILL WITH HIS WILL. Recently it was my father’s anniversary of his passing and not only do I pray for him but my family and I had a mass celebrated in his name. November is the month of “ALL SOULS, “again we have masses celebrating our beloved. One cannot get out of purgatory by themselves, hence we need to live your lives for God now and hope for a better eternity for ourselves. We need prayers from the living. Prayers are never wasted, if you pray and your beloved are already in heaven, God will use your prayers for someone else who need them. The rosary(given to us by Mary) prayed by oneself or with others, helps souls get to heaven. ETERNAL REST GRANT UNTO HIS/HER (NAME OF PERSON PRAYING FOR) SOUL O LORD AND MAY PERPETUAL LIGHT SHINE UPON HIM/HER.